Last but not least, the 2008 Reader's Choice Award for this year's most visited post goes to our April Fool's joke, 'Introducing AdSense for conversations'. Co-author Julie Beckmann had this to say: "A lot of hard work went into omega testing the product for this post. While I found the hat fit snugly, I was disappointed to learn the effect my Orange County upbringing had on my chats -- 17 'like's' sprinkled into a two-minute conversation? My chats aren't fit to be placement-targeted." Thanks for helping to contribute to an eventful 2008 -- we're looking forward to an even more exciting 2009. Happy New Year! As 2008 winds down, we'd like to follow tradition and close out the year with a look back at a few of the biggest happenings in AdSense. In 2008, we introduced new features like AdSense for feeds and an improved version of AdSense for search to help you generate additional forms of revenue. We brought Google Ad Manager out of beta to help publishers with smaller direct sales teams more efficiently sell, schedule, and deliver their ad inventory. At the same time, we worked towards providing more information within AdSense accounts. In April, we enabled the Ad Review Center in all accounts to help you review ads placement-targeted to your sites. And in response to requests for more insight into your reports, we launched link unit reporting and began inviting publishers to link their AdSense accounts with Analytics. Internationally, we launched AdSense for content in Thai and also expanded Western Union payments to a number of new countries such as Egypt, Taiwan, and Panama. To help more publishers find answers to their questions, we launched AdSense Help Forums in Hebrew, Czech, and Slovak. On the English Help Forum, we celebrated our 50,000th member and then unveiled a new platform with additional capabilities. Now, forum participants can vote on the best answer to their questions, subscribe to individual discussions, and receive replies to their threads via email. 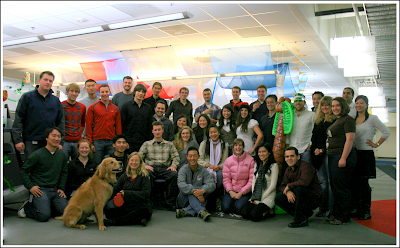 From all of us here in Mountain View, have a safe and happy holiday season! Manage your SiteLinks. Your most valuable links may not be the ones that Google chooses as SiteLinks, so remember you can remove any that you don't think users will find useful. Check for errors and keyword traffic in Webmaster Tools. See our diagnostics checklist. Serve accurate HTTP status codes. If you've retired a page permanently, serve a 404. If you've simply relocated it, serve a 301. The more we know about your old pages, the faster we will find the next best page on your site for a given query. Users and search engines like organic content. Make some of your own! Get the latest updates from the Webmaster Central Blog. Find answers to your questions in our Webmaster Help Center, or ask your questions in the Webmaster Help Group. Whether it be the perfect gift, the perfect site, or the perfect cup of cocoa on a cold winter's night, we hope all your searches are fruitful this holiday season. We all know how it feels to find the perfect gift. After scouring stores far and wide, suddenly your hunt is over: the stars have aligned to bring you just what you're looking for -- and not a moment too soon. It's a bit the same way when a search brings you to just the right site. But what if your site's just the right site, and users can't find it? We're happy to let you know that you don't need divine forces to play a role in the findability of your site. Nope -- you can help make sure that your site turns up just when it should by taking advantage of these tips from our Search Quality Team. Not sure if all your pages are being seen by Google? Search for your site's address after the command "site", like [site:example.com]. When you see your pages in the results, check your snippet content and page titles. Include information that matches the topic of a particular page. If anything is missing or you want more details, you can also use the Content Analysis tool in Webmaster Tools. If you upload new pages or topics faster than Google crawls your site, make sure to submit a Google Sitemap and include a refresh rate. Label your images appropriately. Users searching in Google Image Search will more easily find the image on your site. Don't miss out on potential traffic because of [001.jpg] instead of [NintendoWii.jpg]. Image Search is one of the largest search properties out there, so you should take advantage of it. We've now extended the deadline to pick up your Western Union payments from 35 days to 60 days. If you haven't picked up your payment within 60 days of issuance, the payment will be credited back to your account and a payment hold will be placed on your account. You'll then see a notice in your account with more details on how to proceed. As you may know, Western Union has specific payout limits depending on location. In the past, if your payment amount exceeded the Western Union payout limit in your country, we'd send your payment by secured express delivery check instead. Unfortunately, this would also incur a delivery fee, so we're happy to let you know that this is now no longer the case. Now, if your payment exceeds the maximum payment amount, we'll divide up the amounts but still send them via Western Union. For instance, if the payout limit in your country is $3,000 USD and your payment for the month is $5,000 USD, we'll send you two payments: one for the limit of $3,000 USD and another for the remainder of $2,000 USD. If you're sent multiple Western Union payments, you'll see multiple 'Payment issued' lines on your Payment history page, each with the corresponding MTCN associated with it. Depending on your local Western Union agent, you may need to pick up multiple payments on subsequent days. We recommend consulting your local Western Union agent for further details. Payment by Western Union is currently available in a limited number of countries, but we're working on expanding the countries we support, and we'll keep you posted with any updates. Do you use Western Union as your payment method? If so, we've just made a couple minor updates that we'd like to let you know about. where we'll walk you through the types of content you may have, and show you where that content is visible across various Google services. We've also enabled comments on the Content Central blog, so feel free to visit the blog to suggest topics for future posts or leave your feedback. If you've already visited the Submit Your Content site, you may know all about the wonders of RSS, so be sure to subscribe to the Content Central blog's feed to receive the latest posts when they're published. Or, enter your email address in the right-hand sidebar to subscribe by email. It's Google's mission to organize the world's information and make it readily available to all; as a web publisher, one of your goals may also be to make sure your content is readily available to all. We've recently taken steps to help you grow your site's traffic: we updated our Submit Your Content site with more information about distributing your content through Google products such as Web Search, Maps, YouTube, and iGoogle. In addition, we launched our Content Central blog, featuring tips and information from Googlers who work on different products. The goal of both of these resources is to help you grow your site's visitors by taking advantage of promotion opportunities in new Google mediums. If you're just getting started with these resources, we recommend visiting the yellow getting started box in the upper right hand corner of the Submit Your Content homepage. Here, we've listed the three steps we recommend all content partners take to begin sharing their content. Alternatively, check out the industry categories where we'll walk you through the types of content you may have, and show you where that content is visible across various Google services. tab. For more information, please visit our Help Center. Many publishers have approached us looking for a way to monetize their domains, and today, we're excited to announce the expansion of AdSense for domains. This product allows publishers to earn revenue through ads placed on undeveloped domains. With AdSense for domains, users can find relevant information rather than see empty pages or "page not found" errors. Today we present ads, links, and search results on the pages, and may add other useful information in the future. To ensure positive user experience and the quality of our network, these sites are monitored for policy compliance and prohibited from using text and images designed to confuse users. Advertisers also have additional opportunities to find their customers, and ads on these pages convert well. In addition, we regularly receive requests from advertisers who have found domains to be an effective way to reach their users. The product will be initially rolled out in phases to English-language AdSense publishers located in North America, and we'll expand to additional regions and languages in the future. To check whether AdSense for domains has been enabled for your account, log in and visit your AdSense Setup tab. For more information, please visit our Help Center. , we had tremendous interest from readers who asked if they could donate their earnings to help victims in China and Myanmar (Burma). We heard you loud and clear, and so we're happy to announce that during the next week, you can donate a portion or all of your entire unpaid balance as of November 30, 2008 to reconstruction efforts in these regions. The earth may no longer be quaking and the waters may now be calm, but help is still needed in these areas. Whether you have a balance of $0.10 or $100 in your account, we invite you to participate within the next week. Just think if everyone donated a dollar, what a difference that would make. As you may expect, there are certain restrictions to donating, and all our normal policies still apply -- so please don't ask others to click on your ads in order to increase your earnings. For more information on how to participate, visit our donation form. Finally, we know that you may be interested in donating your earnings to additional charities and causes. Please stay tuned to our blog for future opportunities to donate in other ways. Back in May, we had tremendous interest from readers who asked if they could donate their earnings to help victims in China and Myanmar (Burma). We heard you loud and clear, and so we're happy to announce that during the next week, you can donate a portion or all of your entire unpaid balance as of November 30, 2008 to reconstruction efforts in these regions. The earth may no longer be quaking and the waters may now be calm, but help is still needed in these areas. Whether you have a balance of $0.10 or $100 in your account, we invite you to participate within the next week. Just think if everyone donated a dollar, what a difference that would make.